Percussionist Marc Anderson has followed a musical path that has taken him far from his hometown of Austin, Minnesota. From the foothills of the Himalayas to the steaming forests of west Africa, Anderson has spanned the globe in the spirit of musical and cultural exploration. He's recognized by musicians around the world as an authority on African drumming. Like his music, Anderson has made the people and cultural traditions he's come across in his travels a part of his personal life. St. Paul, Minn. — Marc Anderson grew up far from Africa. However, the musical traditions found there have had a profound influence on his music. As a musician interested in anthropology, Anderson says the study of African music and culture was essential. But he needed a teacher. "I was doing a lot of Latin stuff. And then you meet someone from Africa -- well, you've arrived at the source," says Anderson, referring to his mentor, Sowah Mensah. "It doesn't get any more essential than that. And, he's a great guy." "He was a full fledged musician before I met him," says Mensah, who met Anderson in the mid-'80s. Mensah had come to Minnesota from his home country of Ghana, in west Africa, and was teaching classes at a local college. Since their initial meeting, Mensah and Anderson have collaborated on many CDs and live performances. The two have become so close, Mensah considers Anderson a brother. When Anderson made the first of several trips to Ghana to study, he stayed with Mensah's family. And Mensah says Anderson's culturally diverse musical tastes are unusual, considering his upbringing in a small town. Why did a kid from Austin, Minnesota, end up ... being into African drumming and Middle Eastern drumming and doing Zen? Everything that's not about Austin, Minnesota -- that's where I ended up. 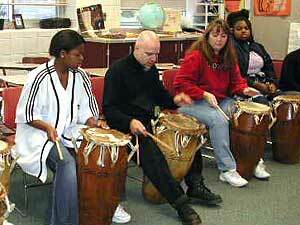 "I knew he was interested in African drumming as far back as high school. He didn't know how to get there or where to find it, but he was interested in it. And that is a remarkable thing," says Mensah. The Far East has also had a profound affect on Anderson. A Buddhist, Anderson can be found nearly every morning before dawn at a Zen meditation center in downtown St. Paul. The ceremony involves quiet individual meditation, group chanting and the ritualistic striking of bells, blocks and drums. Anderson's first drumming of the day is performed to energize the chants and keep the group in unison. He's been meditating for 20 years, and he says the quiet time in the morning helps him prepare for his day. "It's difficult in this culture particularly, and my life specifically -- once the day gets going, it's a little hard to step back and stop," Anderson says. Life is busy for Anderson. He's the father of two children. When he's not touring, he teaches drum classes, lectures, helps fellow musicians record CDs and performs with a number of bands. Anderson has also been the percussionist of choice for many national artists. He's played with Taj Mahal, recorded with Robert Fripp and David Sylvian. Along with producing several albums, he's released two solo projects. His latest is called Ruby, released in 2000. Anderson is currently recording music for an upcoming album by his band, Speaking in Tongues. The band includes musicians from around the world, including nuns from Tibet. Anderson just returned from Nepal, where he recorded them. Anderson continues to log a lot of miles in his musical journey. "Now I look back and say, why did a kid from Austin, Minnesota, end up ... being into African drumming and Middle Eastern drumming and doing Zen? Everything that's not about Austin, Minnesota -- that's where I ended up somehow. So, I don't know how that happens," Anderson says with a laugh.